A decade on since citizenship lessons became compulsory in English secondary schools, work by a University of Lincoln academic suggests the under-threat subject could still help to address young people’s dwindling faith in formal politics. Dr Ben Kisby, lecturer in Politics at the University of Lincoln, analyses why and how the previous Labour government introduced citizenship into the National Curriculum in 2002 in his recent book The Labour Party and Citizenship Education. 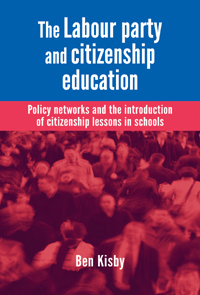 Based on interviews with the key figures behind this landmark policy change, including former Education Secretary David Blunkett MP and Chair of the Advisory Group on Citizenship, the late Professor Sir Bernard Crick, plus a wide range of primary and secondary sources, the book describes how citizenship lessons were introduced principally because of concerns held within and beyond the Labour government about levels of ‘social capital’ in Britain; worries about levels of civic cohesion and social trust amongst citizens. Dr Kisby draws parallels between the Labour government’s policy agenda on social inclusion between 1997 and 2010 and the current Conservative-led Coalition’s Big Society initiative, with its core themes of empowering communities, redistributing power and promoting a culture of volunteering. Despite these similarities, the future of citizenship education in England is currently uncertain. The Curriculum Review Panel set up by the Coalition government has recommended that citizenship is removed as a core Foundation Subject of the National Curriculum. Dr Kisby argues that removing Citizenship as a compulsory National Curriculum subject would be a mistake. Dr Kisby commented that disengagement from mainstream politics in the UK, such as low levels of turnout in elections, membership of political parties and trust in the political class, are very pronounced in historic terms, particularly amongst young people. He added: “It is important that such disengagement is not seen solely in terms of a problem of citizens’ attitudes. It also relates to the kinds of politics on offer by parties. There is too much mudslinging by politicians, despite or perhaps because of the fact that there has been a substantial degree of policy convergence between the major parties over the past couple of decades. “The evidence suggests that young people are not politically apathetic; they have their own views and engage in democratic politics in various ways. However, they have become increasingly alienated from electoral politics. “Many young people have very negative attitudes towards politicians, have been disappointed by their experiences of formal politics and have only moderate levels of political efficacy. Category: Politics, Sociology	0 Comments.